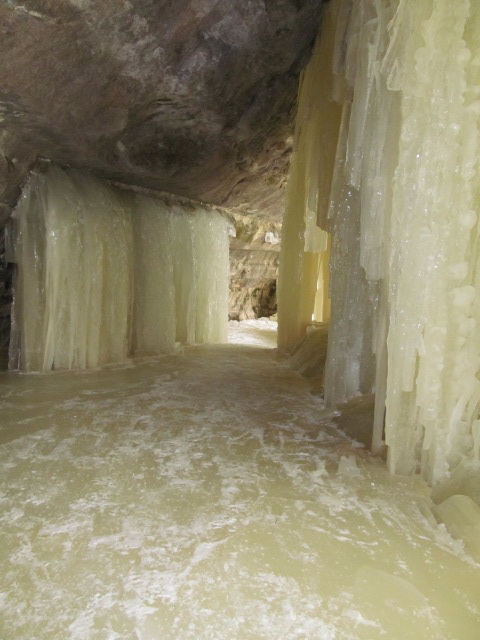 Eben Ice Cave. 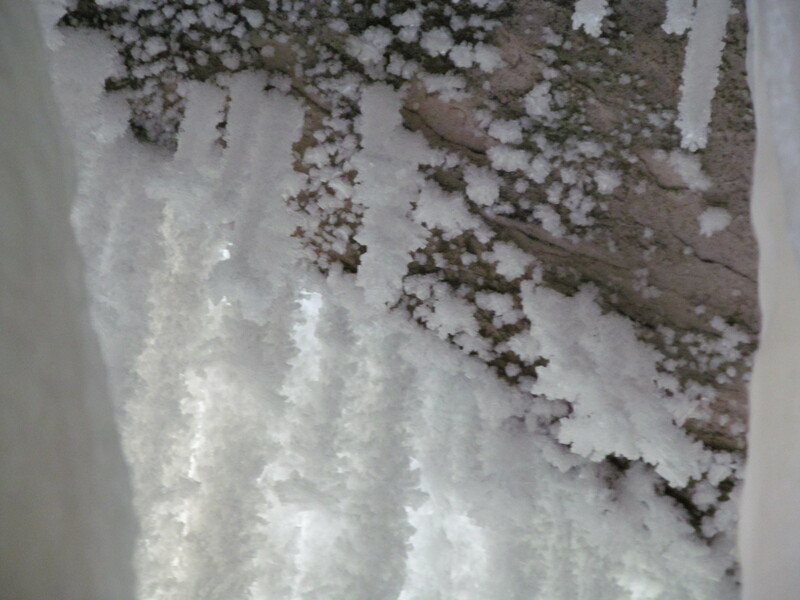 The cave is formed as melting and seeping groundwater trickles over a rock overhang and freezes. 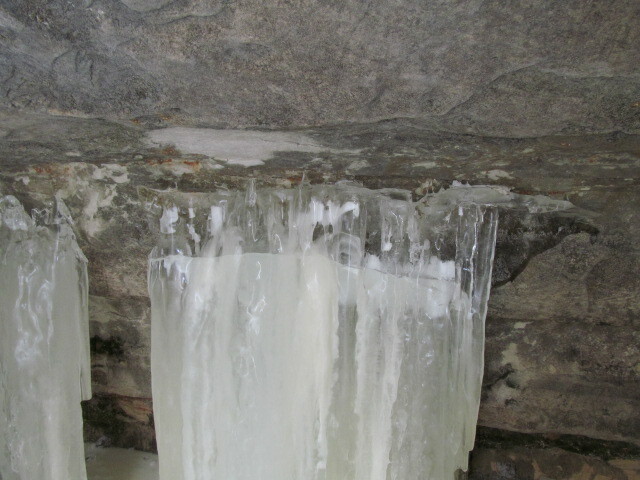 This cold winter was great for ice formation! 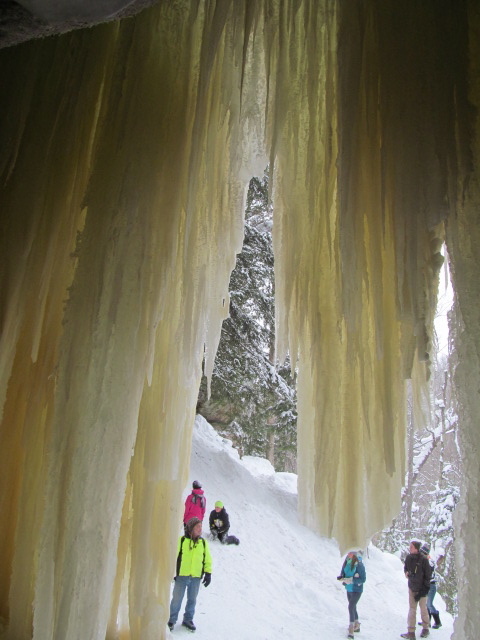 This winter, everyone was talking about the Lake Superior ice caves up in Bayfield, Wisconsin. I thought about going, even tentatively planned to go, and then it got so popular that they were seeing crowds of 10,000 or more on the weekends! I visited the Apostle Islands last summer, and had had the opportunity to kayak out to those “sea caves” in a small group. 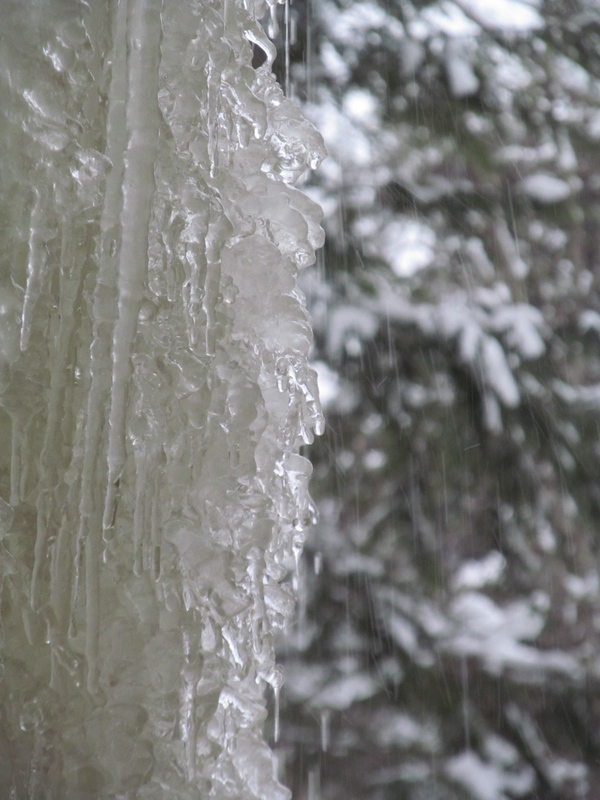 I thought that it would be pretty neat to see them frozen, but that the huge crowds might detract from my enjoyment of wild nature. Of course, if this weather keeps up, the big lake will stay frozen all summer and I’ll get to go see them in July… just kidding! Instead of making the three-hour drive to Bayfield, I took a 1.5-hour trip to Eben, Michigan, in the Upper Peninsula, south of Munising. 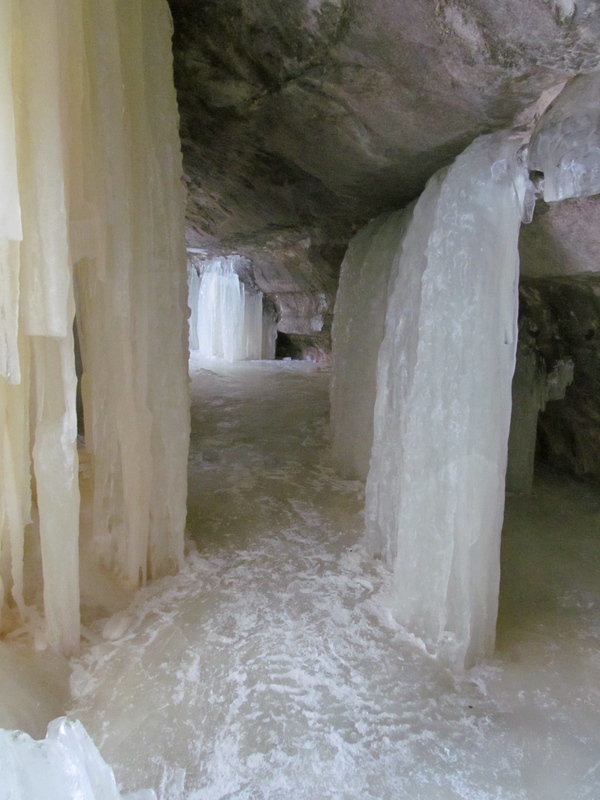 There is a rock overhang there surrounded by seeps which turns into an “ice cave” of its own every winter. 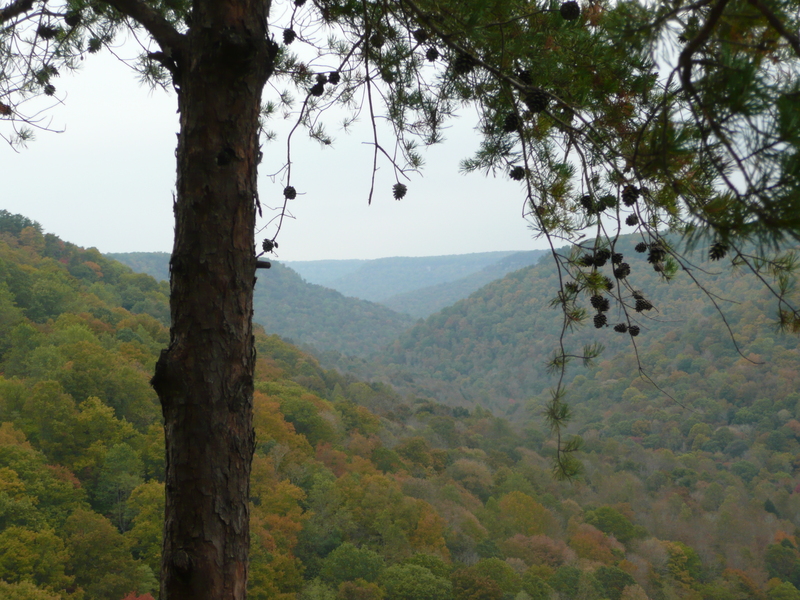 On the day we visited (slightly warmer than average for this winter), there were maybe 150 other people there while we were, including the half-mile hike in and out. It was quite windy and lightly snowing, which meant that this 3/4 mile through the woods was infinitely more pleasant that a half mile out on the open ice of Lake Superior would have been! 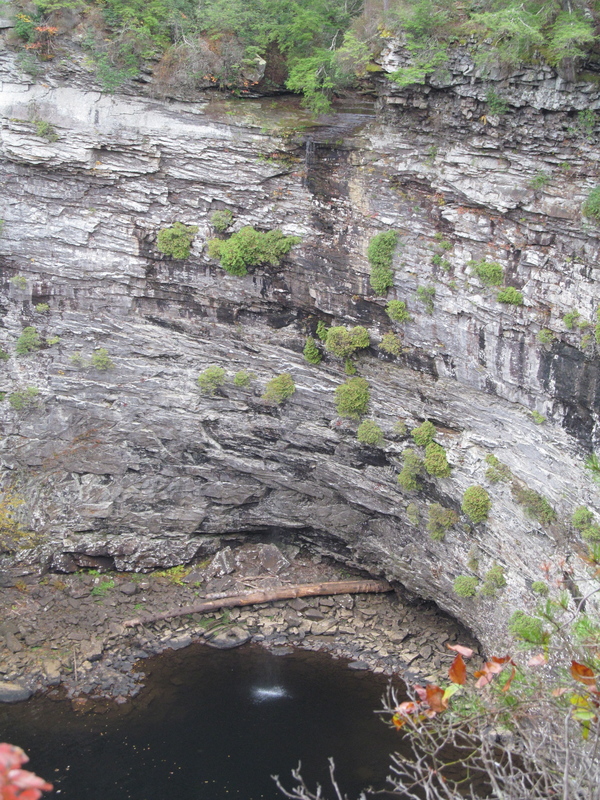 The cave itself included spectacular formations, and was well worth the visit! 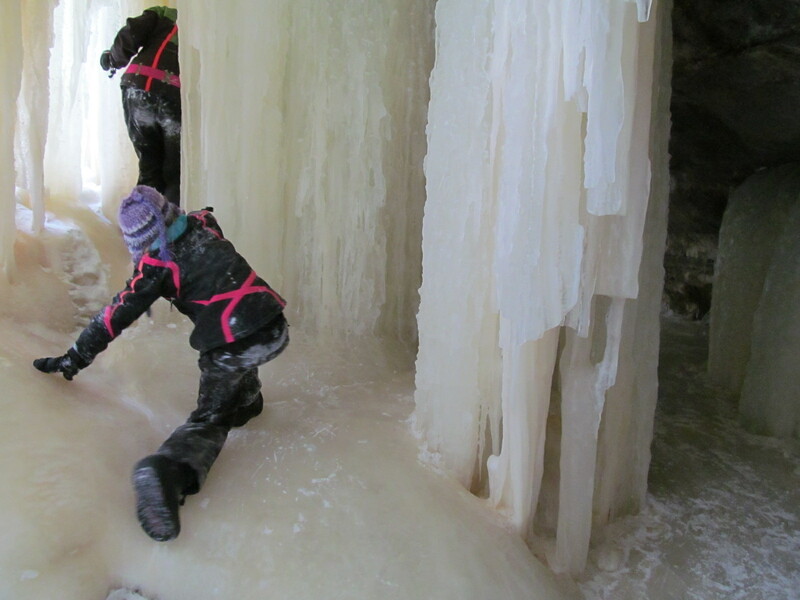 These kids have obviously been exploring the Eben Ice Cave for quite a while! 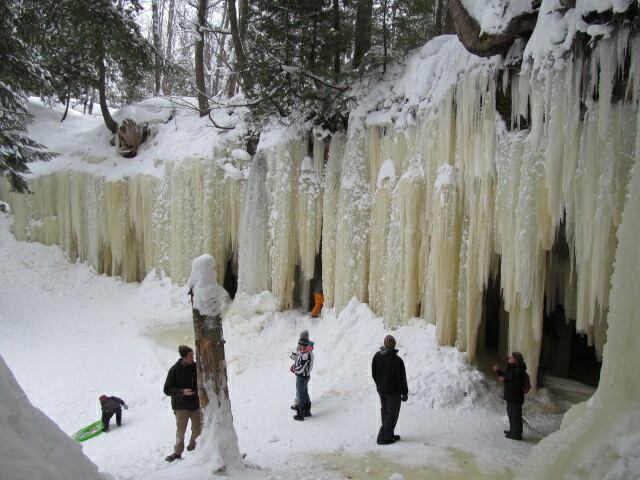 I love these falls of ice seeping out from the wall under the overhang! 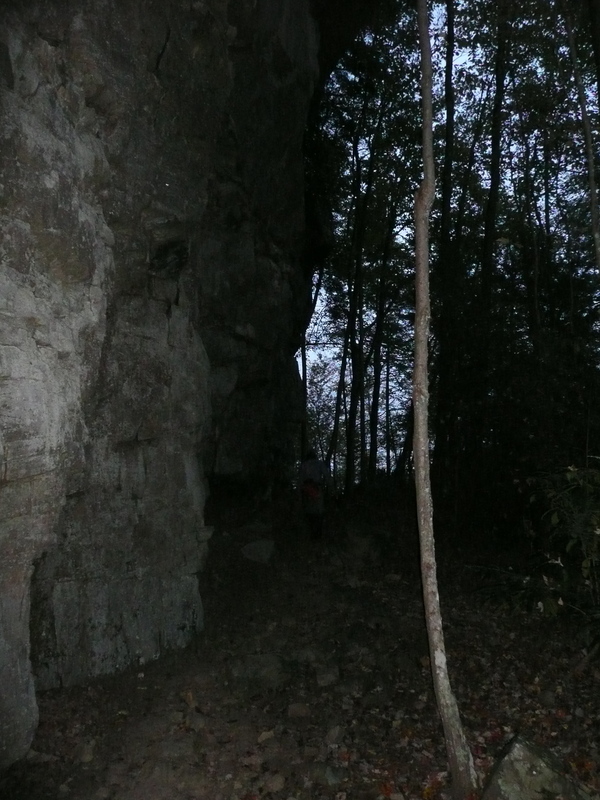 The cave is on public land, but within a federally-designated wilderness area, which means no motorized use is allowed. 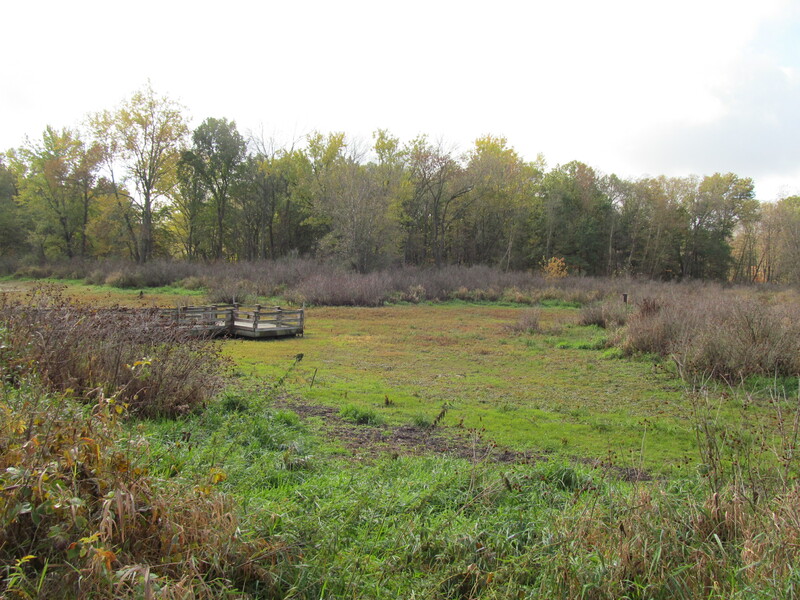 The access is on private land, thanks to a generous landowner. 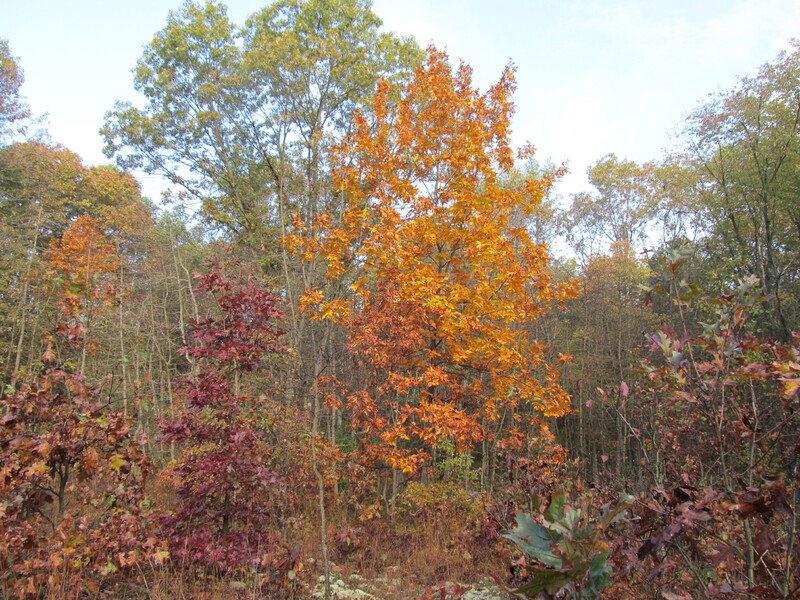 From the tiny town of Eben, small signs point the way to the parking lot. Someone, perhaps the landowner or perhaps the Forest Service, had set up portable toilets for the crowds to use, and a donation box for them, and there was a small private concession stand in the parking area as well. 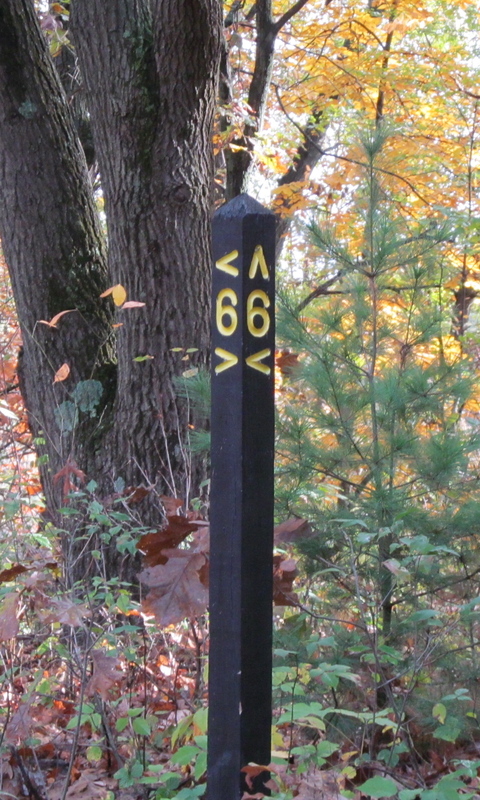 The first part of the walk parallels the snowmobile trail across an open farm field, and after that it enters the Hiawatha National Forest, Rock River Wilderness. Check out that slippery floor! 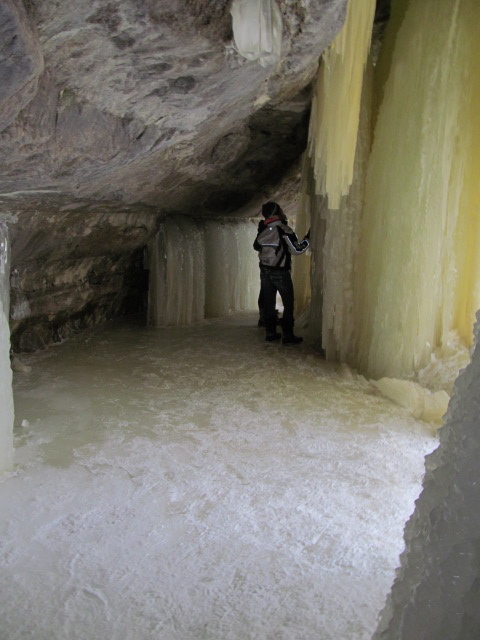 It was awesome to get to walk around among these formations! It goes to show that change is good, every cloud has a silver lining, etc. I may have had to alter my travel plans, but they wound up leading me instead to the tallest waterfall in the eastern United States! 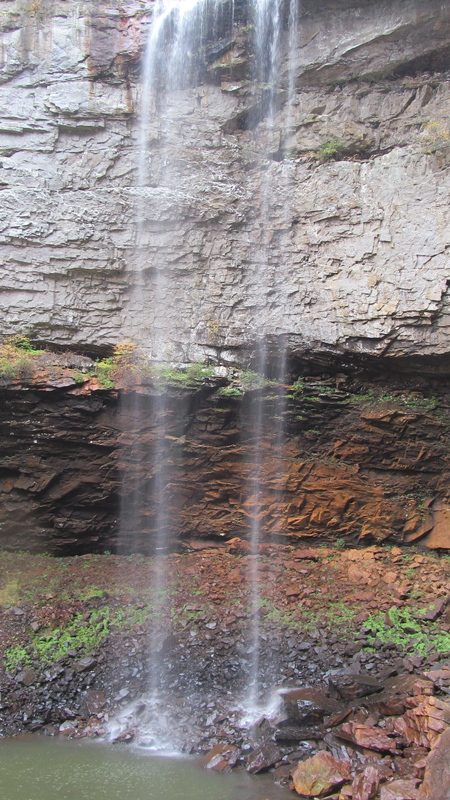 Fall Creek Falls, at 256 feet, the tallest waterfall in the eastern United States. 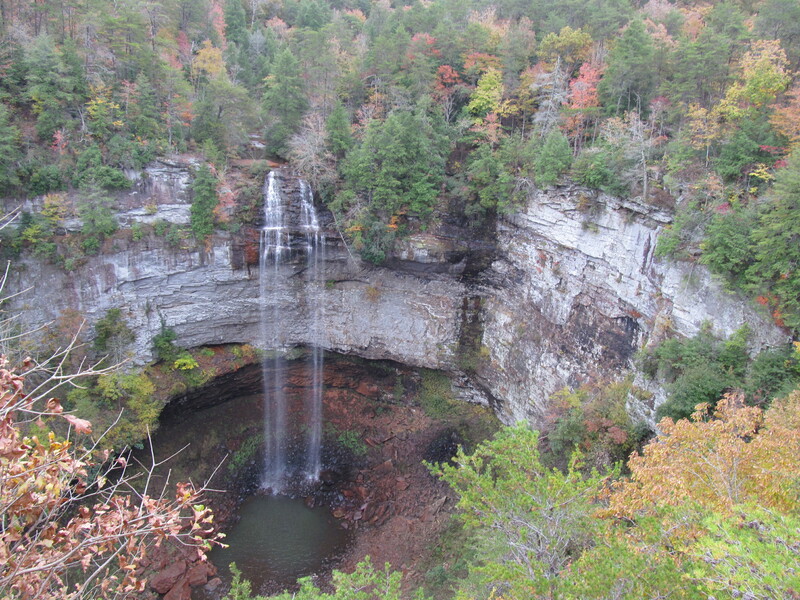 Fall Creek Falls is striking not only because of its proportions, but also as a result of its beauty. 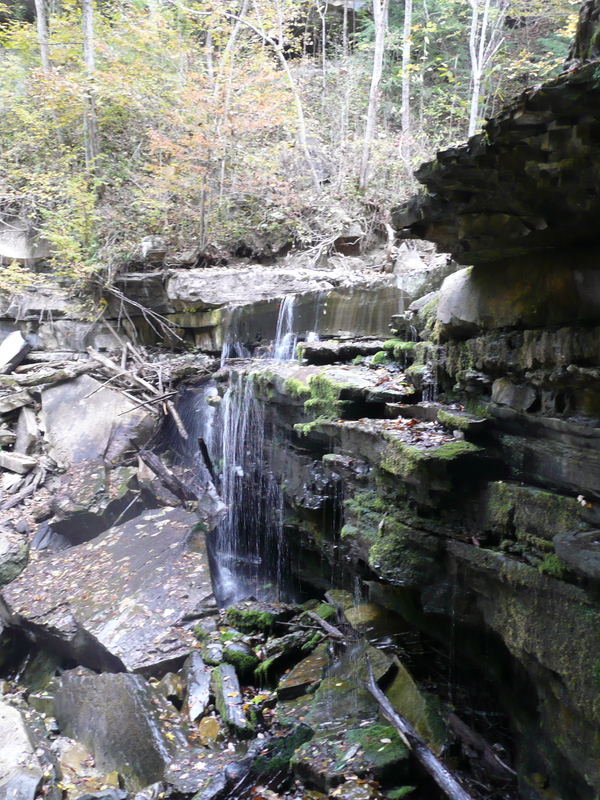 I’m glad that I got to see it in the fall of the year, with low water levels. 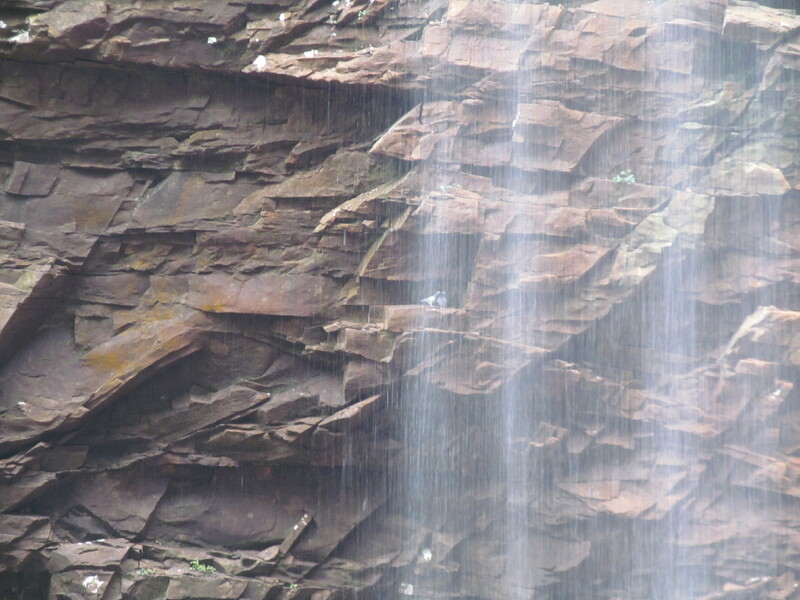 I find that it brings out the facets of falling water best, when there isn’t too much rushing over at once. 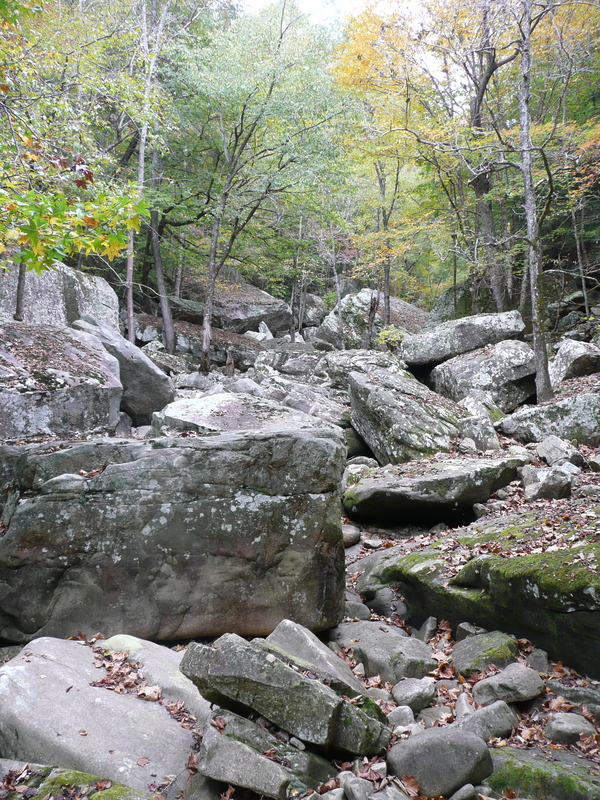 I loved seeing the different shapes of the rocks, the cracks and troughs that the water had formed and flowed through. 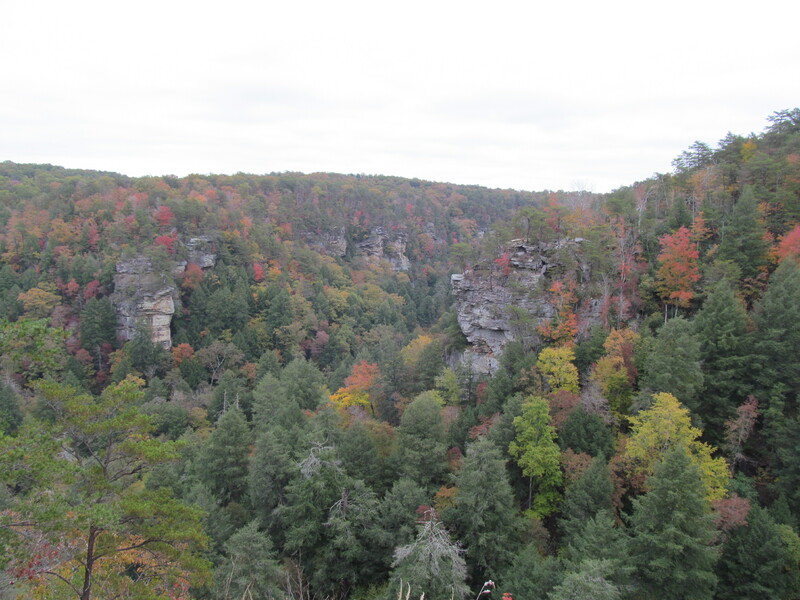 Very of surrounding bluffs from the Fall Creek Falls overlook. 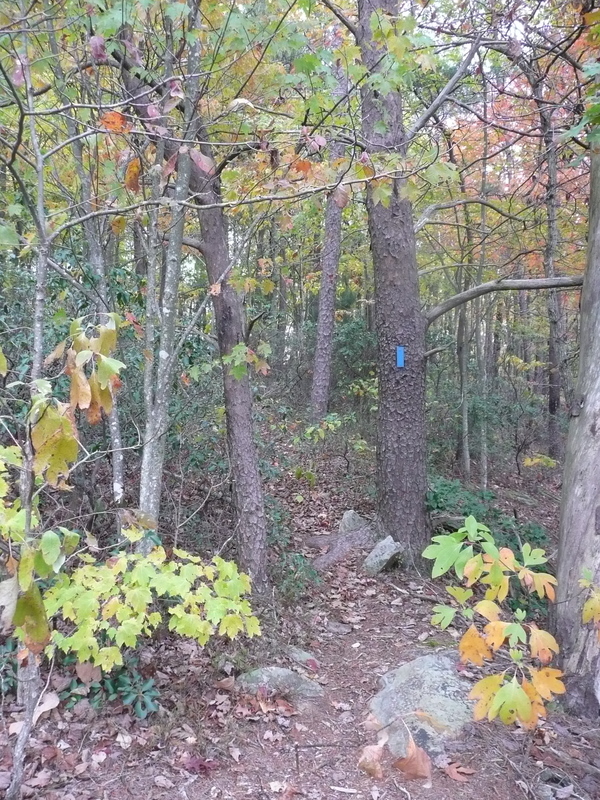 The trail back to the visitor’s center offers a “challenging” variant, that will allow you to walk out to the edge of the bluff near the middle of this photo! 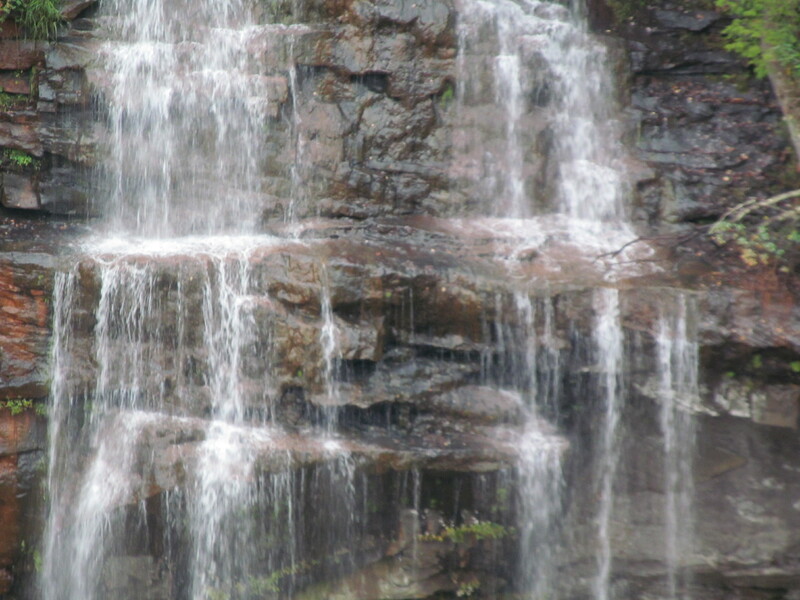 The falls, along with several others, are located within Fall Creek Falls State Park, which offers a ride range of recreational amenities and lodging options. 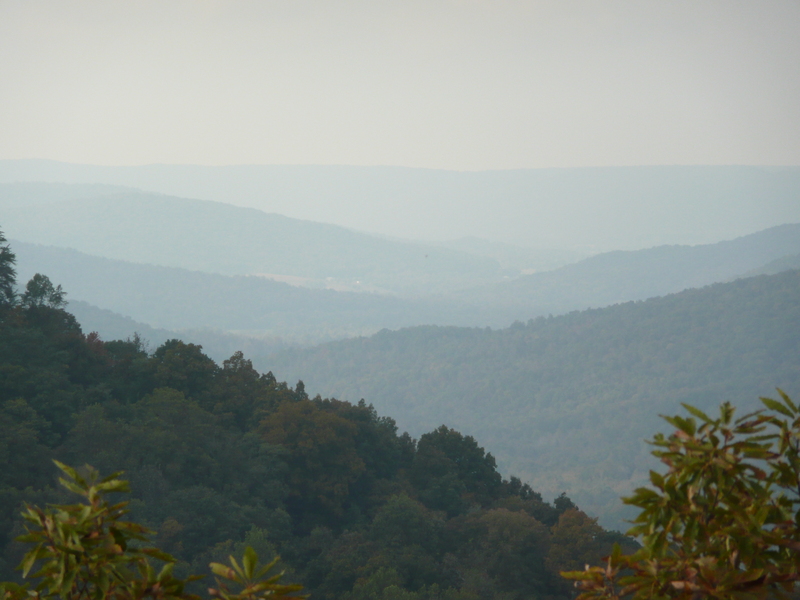 If you just want to see the water and move on, you can park in a parking lot which is approximately 300 paved feet from the falls overlook. 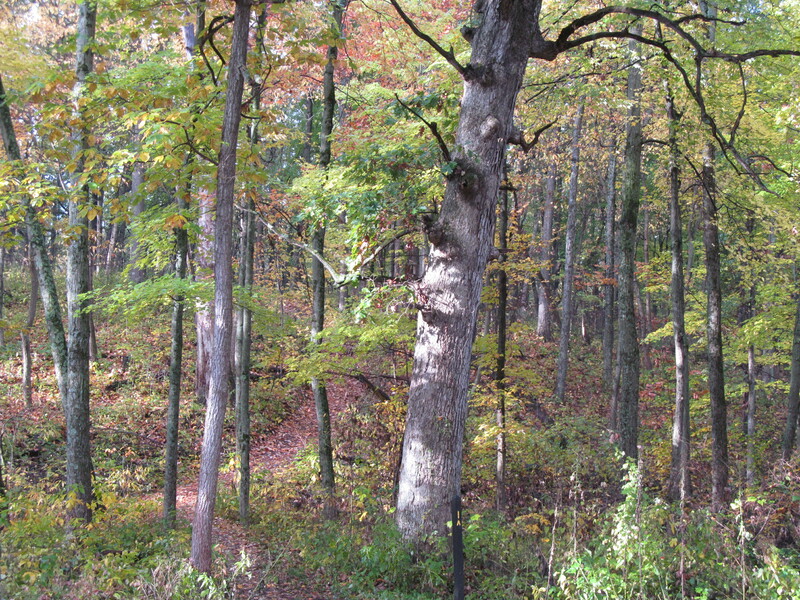 I recommend the somewhat rough 1-mile walk from the interpretive center, though. A waterfall as impressive as this one can be appreciated even better if you work for it a little bit! 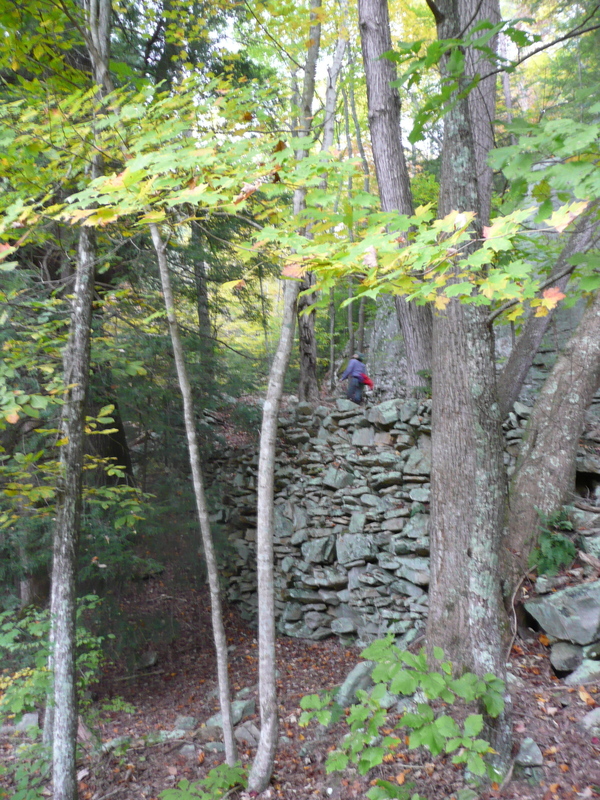 Though, I admit the hike would be easier if I hadn’t done 12 boulder-strewn miles the day before! 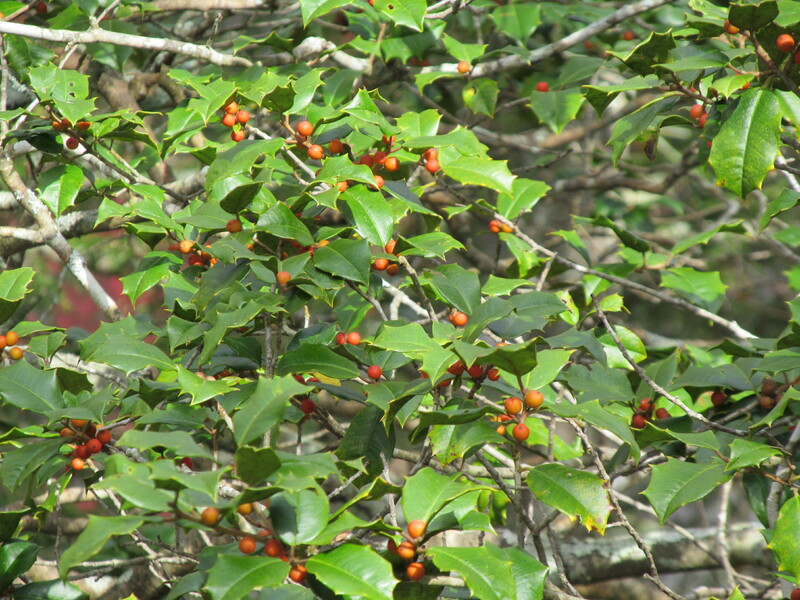 Holly bedecked with berries helps to make the Tennessee woods a beautiful place in autumn! Rock doves seemed to enjoy flying around and perching behind the cascading water – fun to sit and watch at the mid-way point in the hike! 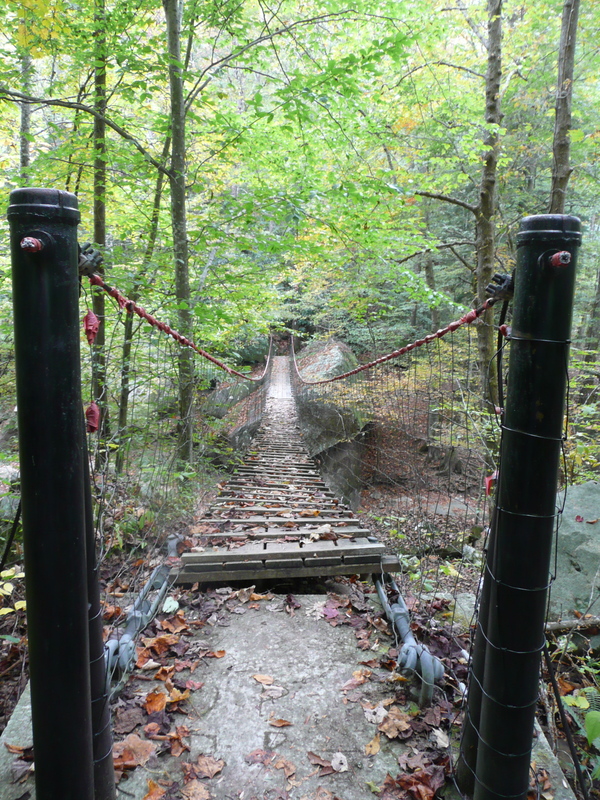 If you are even more adventurous, or a glutton for punishment like myself, you can take the half-mile hike/staircase down to the bottom of the falls. It was lovely, and a great workout! Perfect preparation for the trip home – fourteen hours of sitting in a car, eating gas station food. I earned every bite! 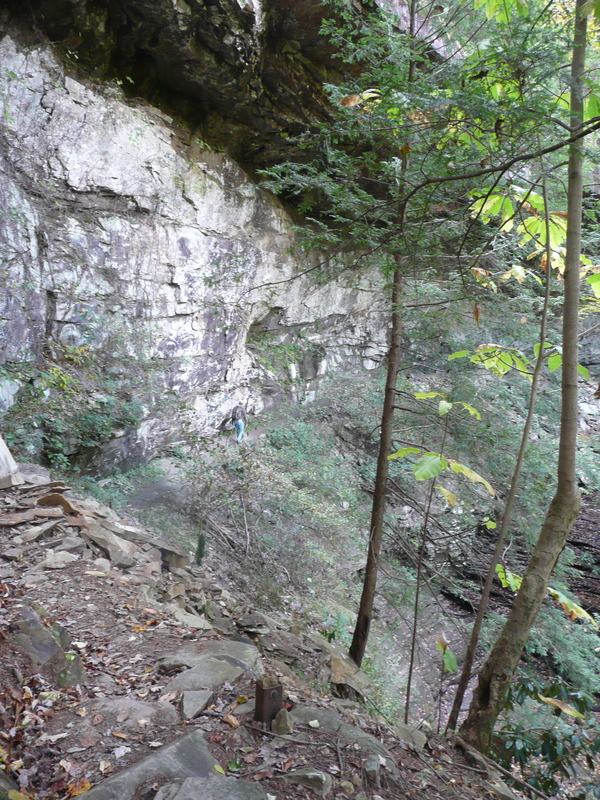 View from the bottom of the trail down to Fall Creek Falls; I chose to rest rather than clamber closer on the rocks.